Turning a regular video into a powerful content and lead generation tool is easy with Vidyard. Adding a default post-roll event to your videos is a popular way to prompt viewers with more information, propose a call to action, or--with Calendly--provide an easy way to book a follow-up meeting in your calendar. 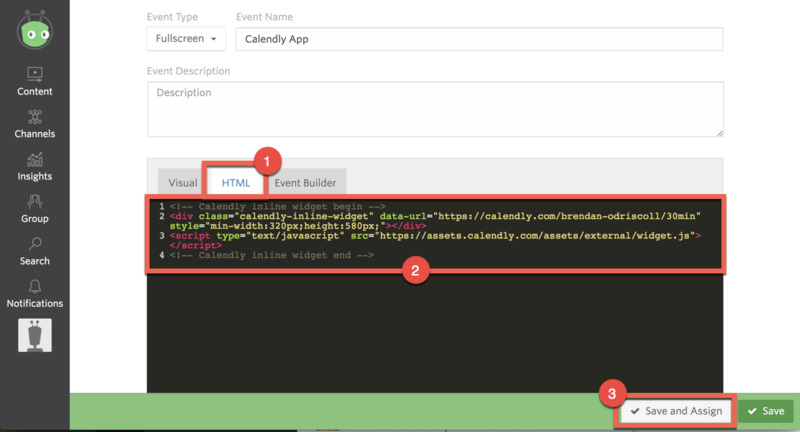 To add Calendly as a post-roll event, copy of the embed code of an Event Type from Calendly. Now, login to the Vidyard platform and use the embed code from Calendly to build a post-roll, default event. Scroll down to the Event Builder. Select the HTML tab, then replace the existing code with the embed code copied from Calendly. Toggle the Default Event switch to ON, then select Post. This will assign the Calendly post-roll event to all current and future GoVideo recordings. Note: if you create a playlist of videos, a post-roll event will appear at the end of the last video in the playlist.